I love Seville, I’ve been living here for five years after all. But there are only so many times you can marvel at the immense grandeur of the cathedral’s Giralda Tower or pad in rapture through the maze of water features in the Alcazar Palace. Eventually you come to realise that the true essence of the city lies in those less frequented nooks and crannies that only nosey parkers like myself tend to find. But fear not, in this Secret Seven things to do in the Andalusian capital I’ll cut out the leg work for you and take you straight to the city’s clandestine treasures… where you’ll feel like you’re the only tourist in town. UPDATE: But…. if it is your first time here, and you haven’t checked off this sultry southern city’s unmissable attractions you’ll find a “Famous Five” selection to go with this “Secret Seven”. Ok, so it would be a missed opportunity to come to Seville and not see any flamenco. But forget the touristy ‘tablaos’ with their steep entry fees and head instead to a ‘peña’. 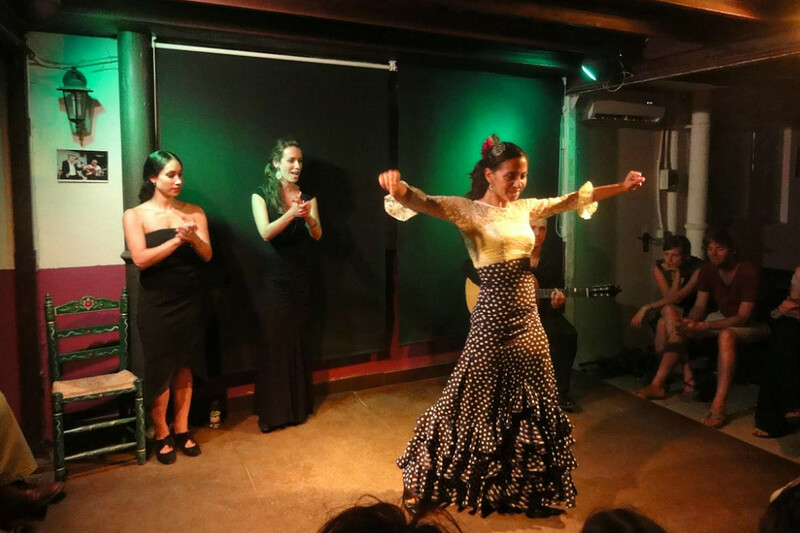 Peñas are best described as a flamenco social club and are home to some of the most authentic flamenco on offer in the city. I love the Peña Cultural Flamenca Torres Macarena for its fighting spirit (it was temporarily closed down by the local council due to regular complaints by a non-flamenco loving neighbour), the beautiful, orange tree bedecked courtyard and the explosive and impassioned shows that guarantee quality on every visit. Performances are only on Wednesday evenings so for weekend flamenco try the Peña Níño de la Alfalfa. Top tip: be sure to stay until the end of proceedings to enjoy the ‘fin de fiesta’ in which any flamenco artists in the audience, dancers or otherwise are encouraged to take to the stage for a flamenco free-for-all. Dance like everybody’s watching (photo by Nino de la Alfalfa). 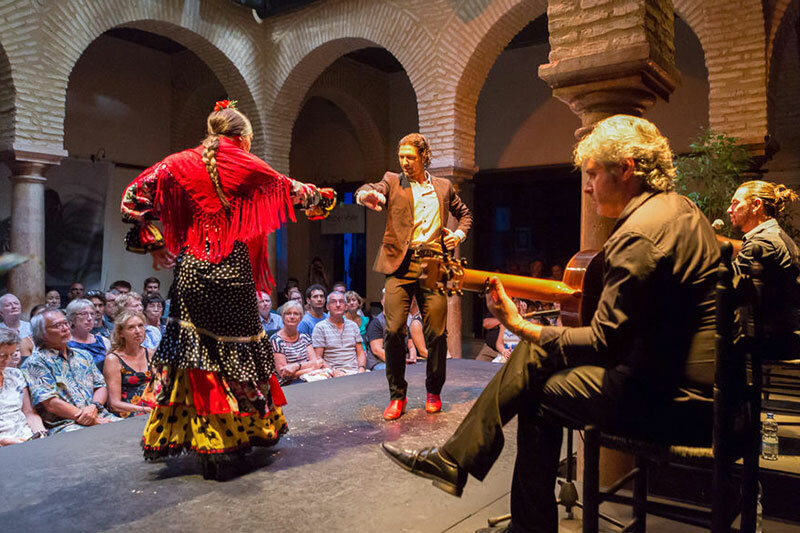 If you don’t feel comfortable going to a concert independently then alternatively this tour by Get Your Guide teaches you about the history and traditions of flamenco, and finishes with an 1hr long show, accompanied with manzanilla wine tasting. Or better yet go the full distance and sign up for a flamenco dancing lesson! From Moorish times Seville has been a city where family life unfolds inside the cool, interior courtyards that form the heart of many traditional dwellings. This principle also extended to working life in the form of corralones, where craftsmen’s studios lined a private central area. The corralones continue to function to this day and range from those languishing in states of decaying splendour to modern ones constructed in Berlinesque minimalist lines (check out Rompe Moldes for an example of the latter). My favourite is the Corralón de Pelicano, in the San Julián district, lying just within the old city walls. Dating back to the 19th Century, it was the city’s first industrial estate. 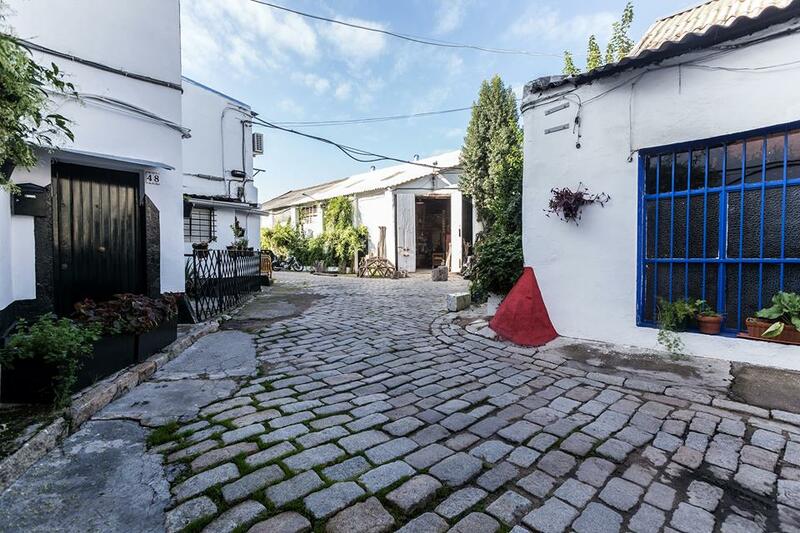 But don’t be fooled by its olde worldy cobbles, geraniums in pots and images of the virgin; inside there beats a very modern, creative pulse with the artsy, collective Pelicano5 featuring contemporary artists, a mad inventor and an artisan, high-end carpenter. When shopping in Sevilla, forget the big name Spanish brands like Zara and Mango and go straight to local individual designers and their studios. My favourite is La OSA Mallol, comprising ex-architect Lourdes and her ingenious, multi-use, reversible designs and theatre costume designer Isa with her own one-off pieces for women, super cute kids’ line and exquisite, couture-clothed, character dolls. 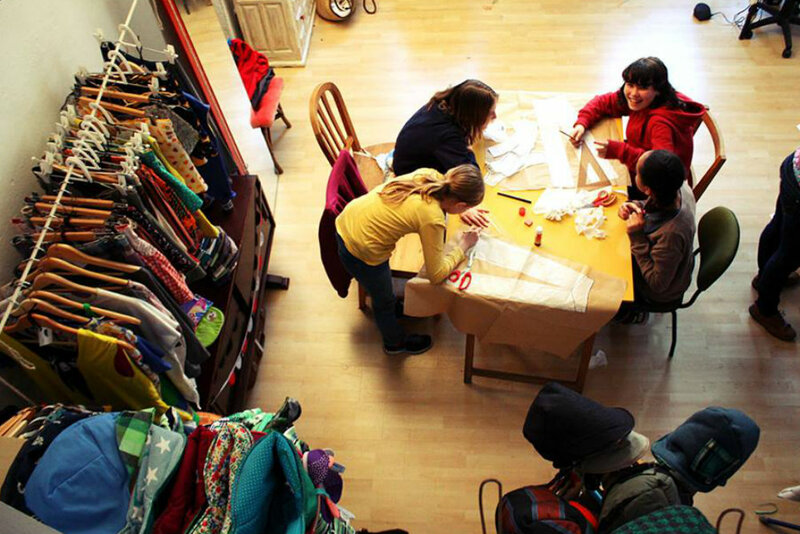 But La OSA Mallol’s creativity doesn’t stop there, and if you’re in town for a little longer you might want to check out one of their workshops on upcycling and dressmaking. Make friends with some local designers (photo by La OSA Mallol). Seville is really stunning, but god do I wish it were closer to the sea. 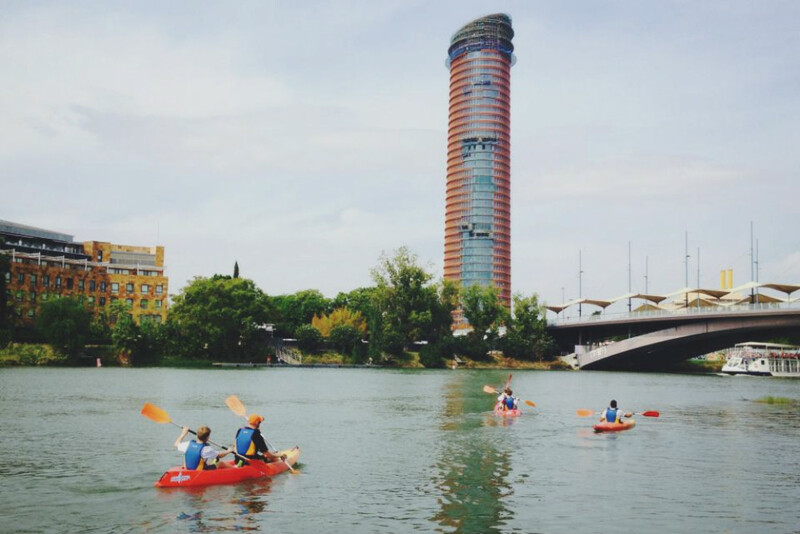 Still, it has got the beloved River Guadalquivir and instead of just strolling along the river banks, why not take a kayak tour where you can see the bridges from the bottom up and commune with the local flora and fauna. Local tour company Not Just a Tourist offers a two hour kayak tour along the closest thing Seville has to the sea, just make sure you pick a sensible time of the day to be out in the water as the midday Spanish sun can be cruel indeed. You can book the tour securely and at the best price via Get Your Guide. (Editor: and in doing so you’ll be putting a couple of euros in UTB’s pocket so we can commission more articles from our wonderful team of writers. Gracias queridos amigos!). Can I kayak it? Yes you can! (Photo by Not Just a Tourist). Sevillanos vehemently defend their cuisine as not only being the best, but also the healthiest going. Frankly, I beg to differ as after a few days of mostly deep-fried fare, my intestines generally long for some fat-free days off. Imagine my delight then when I recently discovered ‘Estraperlo’ a shop selling organic produce which is so hidden away that even I didn’t know about it. 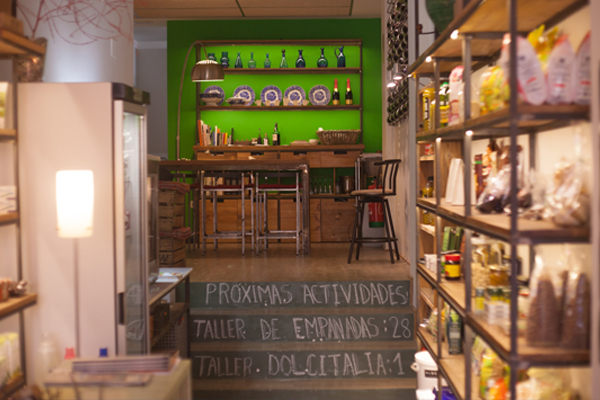 Nestled in a shady courtyard in the hip Alameda de Hercules district, Estraperlo doesn’t just sell locally grown, organic produce; it also boasts a working kitchen at the back producing a daily tapas menu to be enjoyed in situ or taken away. Seeing live music is a tricky business in Seville. It’s easy to imagine oneself stepping off the plane only to be greeted by a travelling troubadour playing flamenco guitar. But in reality the city’s live music scene rather precariously relies on unlicensed venues which open and close depending on the noise sensitivity of the neighbours. Thank goodness then for music promoters La Matraka who’ve creatively manoeuvred their way round these restrictions, making use of the city’s private spaces to lay on intimate, cultural events. 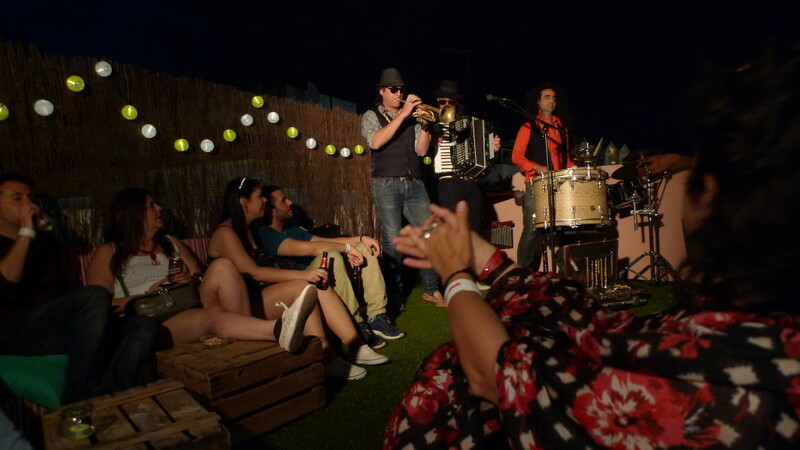 Redetejas, currently in its 3rd year, is a summer season of live music gigs, comedy and theatre across the city’s private roof terraces and recently launched, Myplayz uses the same principle to encourage culture lovers to host their own events in the comfort of their own home or workspace. It’s a bit like Airbnb, but for culture. (For more on this “micro culture revolution” trend check out our feature article). Most major Spanish cities have a traditional food market and if you really want to get up close and personal with some local characters then these lively food emporiums provide an opportunity to do just that – along with tasting some great grub of course. Seville’s Triana Market upped its game a while back by opening some hip bars, thus injecting a nightlife into what was once very much a daytime location. The latest to follow suit is the food market on Calle Feria, a stone’s through away from the Alameda de Hercules. Follow your nose to the far end of the 18th century building and there amongst the fish stalls you’ll find a buzzing tapas bar. There’s something to suit all tastes, not just the fish and seafood lovers amongst us, so expect usual suspects such as giant pans of paella or black squid ink rice, oysters and sushi, plus fish free, handmade croquettes and summer, cold soups like salmorejo, gazpacho and ajoblanco. Thursday to Sunday evenings they lay on live music, usually of a jazz or flamenco bent. 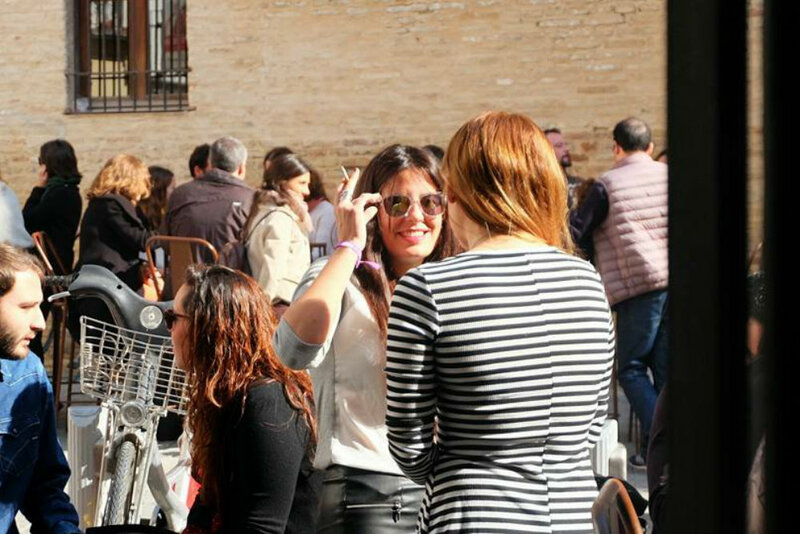 Chilling out on a food market terrace (photo by Lonja de Feria). For those who want to mix authentic local travel, with seeing the unmissable sights, here are our top five attractions in Seville. Of course when in Sevilla, you can’t miss the world’s largest Gothic cathedral, and the third largest church of any kind anywhere in the world (behind St. Peter’s in the Vatican, and the Shrine of Our Lady Aparecida in Brazil). It’s a truly monstrous megalith, made even grander still by La Giralda bell tower which climbs 104 metres into the sky beside it. You can buy skip the line tickets via Get Your Guide. If this place seems like a fantasy location from Game of Thrones… well that’s because it is. 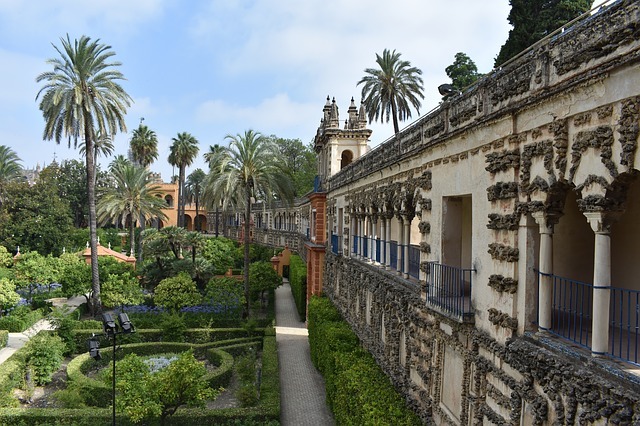 This magnificent palace was extensively renovated by Seville’s Christian rulers in the Moorish style, and its breathtaking opulence made it a perfect choice for the Water Gardens of Dorne in series five of George R.R Martin’s blockbuster. You can buy a guided tour, with skip the line ticket included via Get Your Guide. Top tip: If you plan on seeing both the Cathedral and Alcazar Palace you can save some money using this combined ticket and tour. We’ve touched on flamenco in point 1#, but you seriously… you can’t come to Seville and not experience Spain’s sensational sultry art form in its spiritual home. Museo del Baile offer a spectacular one hour show, three times a night, Monday to Saturday for as little as €22… grab your tickets here. For something even more refined book a tapas dinner at Patio Andaluz, with their 1.5 hour show, which runs every night of the week. A little cheesy perhaps, but who doesn’t like a boat cruise? 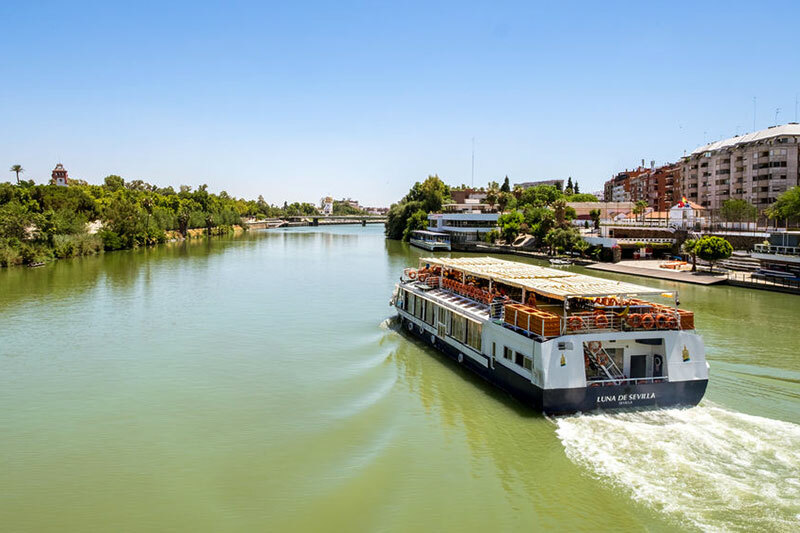 The tongue-twisting Guadalquivir river played a key role in Spain’s colonial history so this is a chance to float on its lazy waters and take in views of some of Seville’s most important monuments while you’re at it. One of the more fun things to do in town. Tickets are just €17. Seville is no jewel in isolation. Andalusia has a very strong claim to be Spain’s most romantic region, and nothing says Iberian charm like its Pueblos Blancos (‘White Villages’). These traditional communities are almost untouched by the passage of time, and their gorgeous white washed walls, terracotta tiles and brightly coloured shutters are a joy to behold. 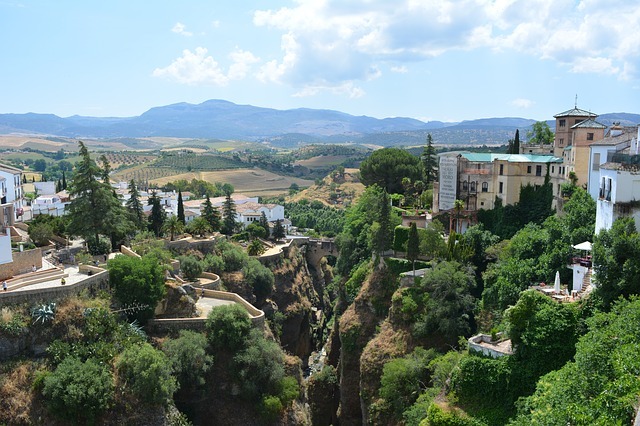 Many of these pueblos even enjoy dramatic locations that further enhance their beauty, none more so than Ronda, which enjoys a spectacular roost on the top of a natural gorge. If you don’t have the time, means or money to hire a car, then jump on this highly rated day trip that makes exploring these Andalusian gems easy. Still looking for more tips and inspiration? Then head over to our Seville city break feature which not only features advice on the best things to do and see, but also runs down the best hotels, restaurants and bars in town. If this post hit the spot, then be sure to drop by our other posts in the Secret Seven series, such as our cool things to do in Athens, hipster hang outs in Rome and some alternative suggestions for Berlin. Feature photo by Breen Jones. Mary, I haven’t been to Seville in 4 years but this post makes me want to return! The organic food and tapas place sounds like my personal heaven. Thanks for sharing these tips!! We have been to Spain many times but never Seville and we are thinking of coming in March and wondered if you could tell us the coolest area to stay. We have lived in Shoreditch in London and Williamsburg in Brooklyn so are after that kind of area. Great post! Seville is definitely one of Spain´s most underrated cities and hides so many treasures that just ooze Andulsian zest. Thank-you for sharing your tips and I will definitely seek out to do these well-kept secrets on my next visit to Seville. 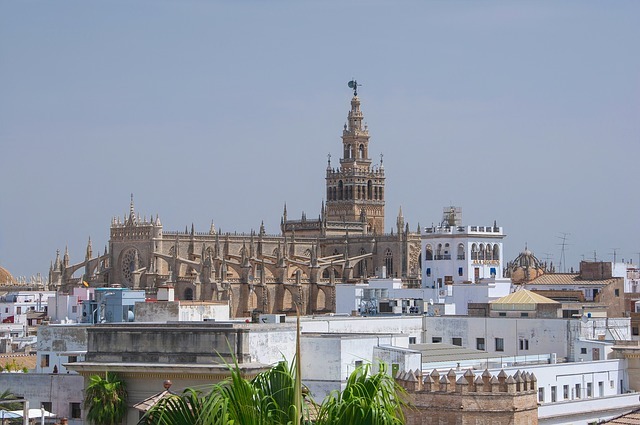 I’m wondering where Seville ranks on the cities you’ve visited in Spain? Because I get asked frequently on my top 5 favorite cities I’ve been to, and Sevilla is always included in that top 5 (Istanbul, Kyoto, Paris, & Chicago being the other 4). I absolutely love this city. Great read and pictures! Thanks, Mary! We’ll visit all of these places! Can u recommend a cool place to stay for 4 in/near the Barrio de Santa Cruz??? Thank you! I am also interested in cool / non touristy places to stay in Seville? But was unable to access the reply to that question above? Please subscribe me to the Urban Travel Bulletin! Originally from the Isle of Wight, Mary decided to upsticks and head south to Andalusia after discovering an affinity with Spain and its people. She lives in Seville where she delights in uncovering little known treasures. Read Mary's full bio here. Why not join 50,000+ travellers a month? Subscribe to our newsletter and you'll get all our freshest guide, stories and tips - for free! 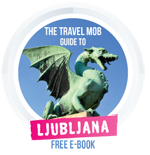 (BONUS: subscribe now and we'll also send you a FREE E-book to the beautiful city of Ljubljana).